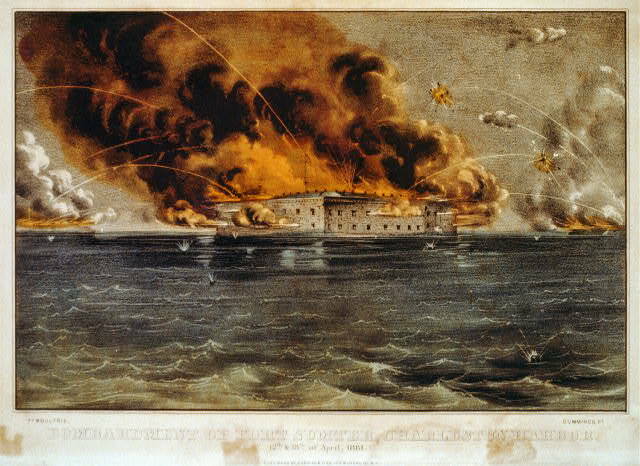 I am putting the finishing touches on my Crisis at Fort Sumter simulation, which my students will work on throughout this week and present next Tuesday. Thanks to those of you who offered suggestions on primary and secondary sources. One of the documents that I am including comes from William Freehling and Craig Simpson’s edited collection of speeches from the Virginia State Convention that met in early 1861 to discuss the secession crisis. I want my class to reflect on the importance of maintaining Virginia in the Union along with the rest of the Upper South. On April 4 the Virginia convention voted 88 – 45 to remain in the Union. Included in their documents is an excerpt from a speech given by Representative Chapman Stuart of Augusta County Tyler and Doddridge counties on April 5. What I like about this document is that it first reminds us that slavery was central to the concerns of this group. Most convention members would certainly have disagreed with folks today who deny the centrality of slavery in the deliberations of Virginians in the wake of Lincoln’s election and inauguration and in contrast with those states that viewed the Republican Party as an immediate threat. What they miss is the fact that many conditional and unconditional Unionists believed that the institution of slavery was safer in the Union. Chapman owned no slaves and yet he puts forth a vigorous defense of the institution and a commitment to working with colleagues from the Tidewater who owned the majority of Virginia’s slaves. I hope my students are able to use this document to reinforce a line of argument that cautions Lincoln not to threaten the loyalty of those who up to this point have prevented Virginia from seceding. Stuart references the strong desire of his constituents, who hope to maintain ties with the North. Of course, that could easily be challenged depending on how the situation develops in Charleston and the types of choices white Southerners are forced to confront as a result. Kevin, You’ve confused Chapman Stuart with his cousin, A.H.H. Stuart. A.H.H.S. was a delegate from Augusta. C.J.S. was born in Bath Co., but was a delegate from Doddridge Co.
Kevin, I’m afraid you have the Stuart delegates confused with locality. Chapman J. Stuart was born in Bath Co., and was a delegate from Doddridge Co. His cousin, A.H H. Stuart was a delgate from Augusta Co. While, in words, he defends slavery, I wouldn’t call Chapman’s words a “vigorous” defense of slavery. Understanding Chapman beyond the Virginia Convention, and into his time spent in the rise of the state of West Virginia, I’d argue (and I think you point this out) that his words might be more reflective of a delegate walking a fine line in order to avert an internal crisis within Virginia (thereby the “commitment” to work with Tidewater Virginians). Did he believe in what he said, regarding the rights of slaveholders? By Constitutional standards, I would argue, “yes”. Does he believe it in the privacy of his home, on moral grounds? Is he conflicted, even in the slightest, personally? I wonder. What else is there that affirm his personal views, and… are Stuart and his views accurate reflections of western Virginia as a whole, and even an accurate representation the people he was elected to represent? I’m not sure what other documents you are using (and I’m sure you are using others), but standing alone, without greater considerations for C.J. Stuart and the view of the crisis by western Virginia, I’d be concerned that the Stuart speech alone paints an incomplete picture, and gives students only part of which would be of value in giving full consideration to the matter. Yes, slavery continued to be central to the discussion, but the majority in western Virginia (and not just the delegates) made clear that coercion was the tipping point. Thanks for the follow-up Robert. All I can really do is give them a glimpse into various positions, but in the end it has to be complete. That said, how many students this year will be introduced to one voice from western Virginia during the secession crisis? Like I said, my main purpose in using this is to drive home the point that up until Sumter Virginia was holding tight to the Union. The question that they will have to weigh is whether an aggressive posture in Charleston will reveal new threats for Virginians to consider. That said, as we both know Sumter alone did not constitute a sufficient reason for Virginians to leave the Union. Rather, it was Lincoln’s call for soldiers that proved decisive. Thanks again. Of course, and it’s that call for troops that makes clear that breaking point between conditional and unconditional unionists; at least the first wave of those who were conditional. One of the many ironies of the political debates preceding the war is that the pro-slavery Unionists were almost certainly correct: without secession, slavery would have been safe much later than 1865. Of course the secessionists didn’t think they were going to lose a war, but even so I have always wondered why they felt so threatened by staying in the Union. Hello Mr. Levin. This would be a good opportunity for your class to examine the misunderstood position of western Virginia delegates to the Richmond convention. The fact is that most of the delegates representing the 50 counties of the future West Virginia signed the ordinance of secession, and did so without coercion, attending the later adjourned sessions once the ordinance had been passed. I certainly wish I had the time to go into that kind of detail on how secession played out in individual states. Perhaps I misunderstood. You are writing about Virginia, the secession convention? That was my point. Unionism at the convention, particularly of the western delegates, has been greatly overstated by historians, particularly Mr. Freehling. It’s just one document among many that my students are using to write position statements on how Lincoln should handle the growing crisis at Fort Sumter. It’s not part of a detailed exploration of secession in Virginia.